If you’ve ever been to a planetarium, the chances are the presenter took ten minutes or so to heap scorn on the ignorant ancients who must have been smoking and drinking powerful drugs in order to see things like goats or virgins in the night sky. This is usually intended as the first blow against the “completely unfounded” science of astrology. The intended knock out punch is the reference to the Precession of the Equinox which means those Sun Sign columns in the tabloids offer a contrived system that ignores precession. The idea is very simple and easy to grasp. The sign that was rising at the Vernal Equinox has moved back almost one whole sign since their alignment. This means that what are called Sun Sign Geminis are actually Taurus – except of course they are not. Our astrology is seasonal in its basis, just as it was for the ancients. The critics of the zodiac based on Precession are missing the point. Nevertheless, this is lost on astronomers. For them, these things are conclusive proof that astrology and its adherents are delusional and primitive minded. The irony of being called “primitive minded” has not been missed; nevertheless who can blame them for their views in the absence of coherent apologetics? Authentic astrologers would agree on pretty much all counts but come to a very different conclusion. I’m not aware of a true astrologer who isn’t well aware of the phenomenon of the Precession. I would be the first to agree that the appearance of constellations has precious little, if anything, to do with their names. This is where things become really interesting and is the reason I chose the word “primordial” as part of the title advisedly.This is the first in an intended series of articles on this theme. This first part can be little more than a sketch. It serves as an introduction. It has become all but impossible for many to view a clear a night sky with little or no light pollution. It cannot be overstated that this has changed us to a very large extent. It is now common to find people who cannot identify a single constellation or star. Anyone in or close to large city see almost no stars or perhaps none at all. The best viewing experience I’ve had was in a desert area of British Columbia, on a small mountain away from any artificial light and no Moon. At first, the brilliance of countless stars are such that it is difficult to find constellations amongst them until the eyes get used to it. The simple connecting of dots yields little or nothing, In the Middle East, particularly under very arid conditions, it is said that one feels that one may reach out and touch the stars. They seemed very close indeed and quite obviously significant. I would like to take some stars and constellations as examples, questioning the asterisms and looking to alternate, more ancient ways of relating to the heavens. 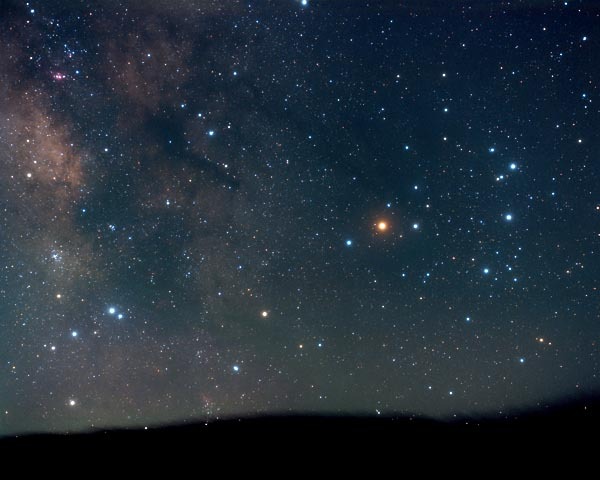 Antares is a bright orange star, It is among the clearest stars and easy to find if the skies are clear and you know where to look. It is in the centre of the neighbourhood of Scorpio and, with our preconceived conception of the Scorpion, we join the dots. 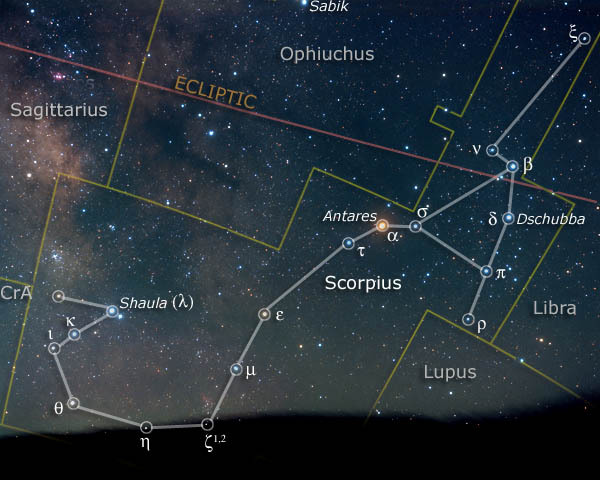 That’s how its supposed to work, but the image below showing Scorpius, probably as clearly as it can be viewed almost anywhere, doesn’t particularly look like a Scorpion. It could just as easily be an angel, a rabbit, a buffalo or a river. Both photos are included here with the kind permission of David Malin. Here is the same section of the sky with constellation lines drawn in. Drawing the ecliptic further helps to provide orientation. Even with the lines drawn, it still takes a great deal of imagination to see the constellation as a scorpion rather than anything else. Unfortunately for the scathing astronomer at the planetarium, that is simply not how the constellations came to be, The situation is of course compounded by the simple fact that different cultures give different names to the same asterisms. Strictly speaking, there are no constellations until we decide that a given asterism has boundaries and significance and visa versa – One might say a constellation is a projection of an archetype. Gavin White has produced three illuminating works on ancient Babylonian star lore that challenge later interpretations. I have consulted Babylonian Star-Lore : an Illustrated Guide to the Star-Lore and Constellations of Ancient Babylonia (2008) and his The Queen of Heaven I have also consulted The Heavenly Writing by Francesca Rochberg, The Epic of Gilgamesh (Gardner and Maier 1984 ed.) Inanna: Queen of Heaven and Earth (Wolkstein & Kramer 1983 The Babylonians (HWH Saggs ] Cambridge UP) and The British Museum. White tells us that: “In astrology the Scorpion’s armoured body segments and its array of weaponry predisposed it to become a creature symbolizing war and the martial prowess of the king. 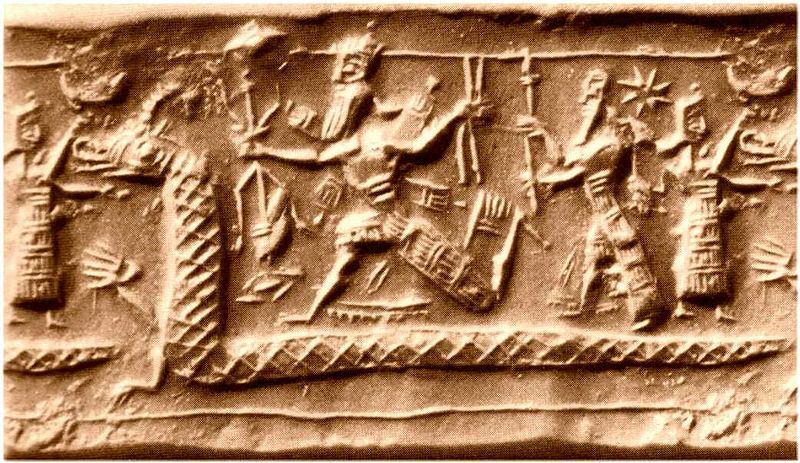 However a different meaning is attached to it in mythic texts such as the Gilgamesh Epic where Scorpion-men and women guard the sacred mountain through which the hero has traverse on his quest for immortality. The Scorpion-people are said to guard the sun at his rising and setting and because Gilgamesh is a favourite of the sun god they allow him to travel the subterranean path that the sun travels every night under the mountain.” (all references to Gavin White’s The Queen of Heaven A New Interpretation of the Goddess in Ancient Near Eastern Art’ by Gavin White can be found on the publisher’s web site). Gula with feathery crown attached to her conical headdress and a Scorpion-Man. 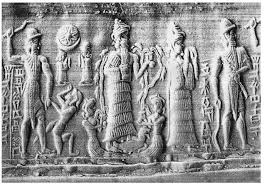 There is a strong need to understand the Babylonian view on its own terms, to the extent that that is possible. Williams writes: “In Babylonian mythology scorpion men were the children of Tiamat, the dragon mother of the universe. The constellations have two primary points of reference. The first is particularly referring to the circumpolar stars. The second which has the most immediate importance is the temporal. This is a simple case of a season matching an asterism which is then circumscribed and named. So for example, Aquarius the Water Bearer rose during the rainy season of late winter and early Spring. But Pisces is now in that temporal place, while Aquarius is rising in the cold but dry season. And how, we may well ask, does Pisces represent either late winter or early spring. What do fish have to do with the season? It takes an exceedingly vivid and guided imagination to translate the asterism to embody two fishes tied together and pulling in different directions for eternity. The same is true of most of the zodiacal asterisms. However, when we look to Pisces as a temporal reference, the time of year of great floods, other significance can be found. Like Anunitum, the Fish symbolizes the season of flooding, which commences in the early spring. 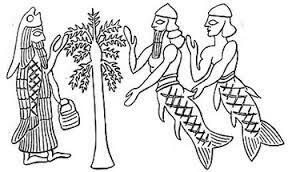 “Like other creatures of the Abyss, fish were thought to be symbols of wisdom and were accordingly held sacred to Enki, the god of creative intelligence, incantations and magic.” (QoH) The cord is indicative of the two rivers flowing into the sea. This isn’t how Pisces is represented today and before the end of the epoch prior to 500 B.C. much, but by no means all, had already been lost. Of course some zodia are deceptively simple. They make sense due to the Season in the Northern Hemisphere; Leo is probably as good an example as any. The Lion has been seen by cultures everywhere as the “king of the beasts” courageous and Solar – why not reign in the hottest and driest part of the year. Our knowledge of Ancient History is poor, but great progress has been made even in the last two decades. It has become increasingly apparent that our classical Greek and Roman archetypes are in most cases pale shadows of their original significance. To get to the heart of the zodiac, we need to go back at least as far as Babylon. Here we find a very different reality where the counterpart of Venus, for example, is the goddess of sexual love, fertility and warfare. The word “pretty” simply doesn’t apply to her. In fact, we have lost most of the archetypal origins of the zodiac and find ourselves trying to make sense of fragments of a powerful, elusive, but clearly profound inheritance. ← The American Presidential Election and why we wouldn’t make a Prediction on the outcome using birth times of the Candidates.